The £2,000 Jane Grigson Trust Award has been shared, between Elly McCausland for The Botanical Kitchen and Dan Saladino for The Ark of Taste. The runner up was Selina Periampillai, for The Island Kitchen. 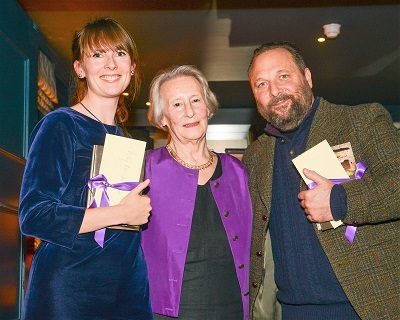 The awards were announced last night at a ceremony at Quo Vadis in Soho. The judges were Geraldene Holt (chair), Clarissa Hyman, Josceline Dimbleby, William Sitwell, and Jeremy Lee. Holt said: "The field of applications was the strongest we've yet received, with an amazingly wide variety of subjects and treatments, and the decision of who should be the final winner was incredibly difficult to make. The judges have therefore decided that, with such talented entrants, the award should be made to two authors who between them exemplify the best of modern food writing. "Elly's is a very well-researched book taking a refreshing view of cooking with seeds and spices, leaves and flowers of familiar and also little-known ingredients. She brings these flavours into focus in a totally delicious way. Dan Saladino's book examines the quiet tragedy of endangered foods. He asks important questions about how and why this is happening and inspires us to act. His book is an eloquent cry for action." The award is made to a first-time writer of a book on food or drink that has been commissioned but has not yet been published. The Botanical Kitchen comes from Absolute Press in March 2020; The Ark of Taste is due from Cape next spring; and Bloomsbury publishes The Island Kitchen this May.